Staffing – Mrs Christine Rae was given a robust send off by pupils and staff recently on her last day in school. After 8 years in the canteen providing soup and support for pupils she has moved on to another job in the community. Her cheery presence around the school is already missed. Mrs Carol Bulmer was appointed Head of Support for Learning after interviews took place recently. We wish her well in her new post as she takes over officially from Mrs Flora Morrison. Next week we will say farewell to Miss Colquhoun. She will leave us to take up a teaching post in the Scottish Borders. All staff and pupils in Gairloch wish her well for her future career in teaching. Senior Prefects – The new senior team of prefects have been appointed. Deputes – Becca Spence, Judith Matheson and Liam Smith. Details of other appointments will be available in the next issue along with the names of prizewinners for this session. Bronze DofE Award Expeditions – S3 pupils took part in their Assessment Expedition on 23rd/24th June. A report will appear online with photos. The trip took place in the wilderness behind An Teallach near Dundonnel. French Trip – 141 pupils and 17 adults and staff headed off for Normandy on the 11th June. After a gruelling bus trip via the Dover/Calais ferry, three coaches arrived at our base, the Chateau du Molay, after 27 hours. The next day we visited the D-Day beaches at Arromanches where pupils saw a film on the spectacular 360-degree cinema. Afterwards the pupils visited the British War Cemetery at Bayeaux. This was a particularly moving experience for many including those staff and pupils who had relatives involved in the original invasion 65 years ago this month. Most of the buildings and streets were still filled with British, Canadian and American flags after the anniversary celebrations on the 6th June 2009. Many pupils took the chance to visit one of the D-Day museums as well as spending time looking at the Bayeaux Tapestry. This very impressive ‘cartoon’ from the time of William the Conqueror is embroidered on cloth and extends for 70 meters. The Chateaux where the group stayed had a swimming pool and a selection of other activities. The pupils made full use of the facilities during their social time. Further excursions took place to Mont St. Michel and St. Malo. In Mont St Michel many of the group took a guided tour of the monastery. This labyrinthine building has withheld the onslaught of many armies and it was very interesting to wander the tunnels hearing the history and mythology of this area under the protection of the archangel Michael. The second half of the excursions took us towards Paris. One coach visited the gardens of Claude Monet at Giverny. Monet spent 40 years building the gardens around his home and they became a feature of many of his most famous works. Pupils studying art were inspired to see the actual lily pond that resulted in some of the most important paintings in modern times. Meanwhile around 90 pupils headed for Paris with the objective of ascending the Eiffel Tower. All successfully met this challenge. Imagine ascending through open metal work for nearly 1000feet. Both groups rejoined for an evening boat trip on the Seine through central Paris. This provided stunning views of Notre Dame and the Louvre however the most interesting aspect of the trip was the efforts of the pupils to attract the attention of every Parisian and tourist and provoke a smile and a wave. Their openness was successful on all but one occasion! Finally before our return home we spent the day in Disneyland Paris. The pupils were a credit to themselves and great ambassadors for the school. Any doubts that taking such a large group abroad were cast aside quickly. In Bayeaux a lady approached staff to comment that she could not remember ever having seen such a polite group of children. Click here for photos of the trip and here for a slideshow. ‘Not the French Trip’ – The staff and pupils remaining in school arranged their own brand of activities for the week. On Thursday 11th June they all went down to Slattadale and took part in mountain bike skills, art, orienteering and the ‘straw challenge’. Day two on Monday 15th June involved a marine boat trip, photography, cookery and football. This menu was repeated on the Tuesday with pitch and putt instead of football. Horse riding was also available on the Wednesday, while some pupils completed a film version of Macbeth at Slattadale. Click here for photos of the activities at Slattadale and here for the Mountain Biking events. Photos of all the events are on the website and thanks must be given to all the staff for making it all possible and to the Parent Council who donated £1700 towards payment of various activities from boat trips in Gairloch to the ascent of the Eiffel Tower and the visit to the 360 Cinema in Arromanches to witness historical footage of the D-Day landings. Parent Evenings – Senior staff and Pupil Support teachers met with the parents of the new intake on Monday 22nd June in the school. The Primary 7 pupils spent a final day acclimatising before starting as High School pupils in August. Parents of the S1 pupils met staff on Thursday 25th June to discuss progress over the last session. Sports Day – This article is written in advance so here is hoping the weather has been favourable. If so Sports Day will have taken place on Thursday 25th June (or 26th June)! The weather was wonderful and events took place on Thursday as planned. Due to the high levels of participation the relays had to be carried forward to the Friday. The final result – Tollaidh won the Sports! Well done to all. Photos are available here. View a slideshow by clicking here. 2nd July – Last day of school before summer break. Details of the Prizegiving and Sports Day will appear in the next issue of the Gairloch & District Times. UNIFORM – A reminder to all parents that after the holidays we hope that all pupils will continue to uphold the high standards expected of the dress code. We are regularly complimented on the smart appearance of our pupils by visitors from other schools and outside organizations, along with manners and behaviour. This year every prefect got himself or herself a blazer and many of them wore it daily to school. It may be interesting to note that the Pupil Council actively supports the uniform as do the majority of parents. We discourage excessive make-up, overt jewellery and fashion add-ons. Throughout the year we look for more substantial ways for the pupils to express their individuality! Two of our S3 pupils have achieved success in a Highland based writing competition aimed at S3-S6. Isabella Claydon won third prize with a story called She and Conal McDonagh received a commendation for Block 616. Both stories have been published on the Highland Council Library website. Bella received her prize at the Town House, Inverness on the 23rd June. Conal was taking part in his DofE Bronze Expedition Assessment and will receive his prize at a later date. Read the Council Press Release here. All the stories are published here. 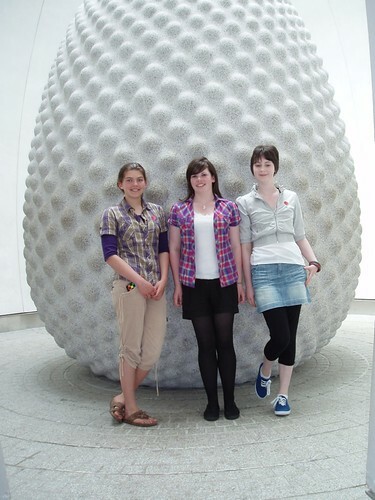 Cornwall and Eden Project – S3 pupils, Kirsty Alexander, Bella Claydon and Anna Hulme, who were involved in the Big Green Challenge Debate visited Cornwall in May. This was their prize for reaching the final of the competition. Read more here about the trip and view some photos. Further photographic success – Katrina Port (S4) has been named a finalist in the Highland Council Energy & Sustainability Photography Competition. As recognition of her work she was presented with a framed print of her entry. The winning photo, taken locally and currently on display at the entrance to the library, will be in an exhibition at the Eastgate Centre in Inverness from 15th to 29th June. Well done to Katrina for achieving recognition in three consecutive photo competitions in the last six months. 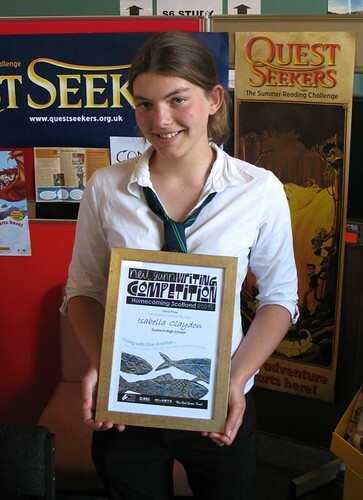 See Katrina’s photo here along with her presentation at school recently. Rugby Selection – Theo Threadgould has been selected once again to play for the Highland and Island’s U16 Rugby Squad. He will now train in preparation for games against Tayside, Fife and other regional teams. Theo plays for Highland Rugby Club and this selection is the result of lots of travel, commitment and hard work on his part. Well done Theo! Ten under the Ben – Five pupils and four members of staff joined hundreds of other riders in the Ten Under the Ben endurance mountain bike race last weekend, near Fort William. Some of the entrants are elite athletes. While not in that category yet, we have been training for this for the last three months. We had not been training for the 27-degree temperature on the day! Our quad team (Matthew Fothergill, James Staddon, Alasdair MacLennan and David Gorman, all fifteen years old and the youngest competitors there) finished seven eleven mile laps in the 11 hours allowed, putting them in a good 9th place out of fifteen teams. Lewis Martin joined Mr Gorman and Mr Milner as one of the 95 trio teams and completed a respectable six laps between them. Mr and Mrs Johnston were also competing, in different trio teams. EXPRESSIVE ARTS DAY – Primary 7 pupils took part recently in an Expressive Arts Day. They worked with Ms Hunter, Music, Ms Hildrey, PE, and Ms Gulliver in the Art Department. The theme for the day was the opposing forces of nature and the man-made world. They worked all day, making appropriate costumes and learning music and movements to represent their groups. At the end of the afternoon they put on a short performance in front of S1 and S2 pupils along with some of the younger Gairloch Primary pupils. To the sound of a lyrical Gaelic song the mer-people made waves with long lengths of silky fabric and we saw sea nymphs playing in the water. Soon, however, the robots arrived and beat back nature, triumphantly moving to their victory song. In time though, the waves came back and started to lap over the robots, rusting them at first and then submerging them completely. But in a final little twist to the plot, maybe the robots had the last laugh! S1 Enterprise Day – On Thursday 28th May, S1 pupils spent the day planning and preparing Packs for the incoming P7 pupils. They worked in teams throughout the day to prepare Welcome Booklets (a pupils’-eye view of the school), fun stickers and bookmarks under the supervision of Ms Gulliver, Ms Leitch and Dr Caley. At the end of the afternoon, in a close contest, judges, Mrs Whall and Miss Colqhoun, reviewed their work. The best of all the groups work will now be compiled into the final version that the new S1 pupils will receive in August. French Trip – 141 pupils and 17 staff left on the 11th June for Northern France visiting the Normandy D-Day beaches and Paris. Not the French Trip – Pupils and staff remaining in school are involved in a range of alternative activities. The Parent Council raised and donated £1700 to support activities for all the pupils, here and in France. 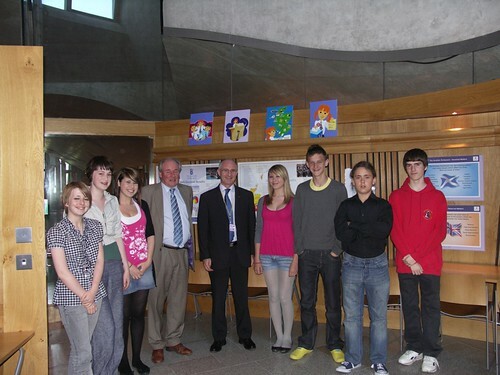 On Wednesday the 3rd of June the S3 Standard Grade Modern Studies class went down to visit the Scottish Parliament. It was a early start at 6am on the Wednesday morning, catching the 8.10am bus from Inverness to Edinburgh. Once we arrived at 1.30pm we dropped off our bags at the youth hostel and then walked through Edinburgh to Hollyrood. At Hollyrood we had a short talk from one of the education staff members, who told us about the different the different procedures in the debating chamber. Then we watched all the MSPs getting very argumentative during first minister’s question time, before meeting Dave Thompson and Jamie McGrigor, two of the MSPs for the Highlands and Islands. In the evening we all went to the cinema, which we all enjoyed! After this we went back to the hostel for the night. The next day we went shopping in the morning. Followed by a trip to the National Art Gallery and “Museum on the Mound”. After that we made the long journey home! We would like to Thank Ms. Velt for taking us down to Edinburgh for the night.